More and more recent evidence shows the pervasive influence the circadian timing of our biological processes naturally occurring over a 24-hour cycle has in almost all of our physiologic functions. Consequently, along with prominent wake and sleep disruptions, circadian rhythm sleep disorders are linked with mood disturbances, cognitive impairment and increased risk of cardiometabolic disorders. Here at Sweet Sleep Studio, LLC, we strive to educate our readers and patients on sleep education through our sleep education blog and videos, since nearly 70 million Americans experience sleep issues. Below we go over the circadian rhythm sleep disorder. We’ll explain what a circadian rhythm disorder is, and its types, symptoms, causes, and treatment. A circadian rhythm sleep disorder refers to sleep and wake timing disruption and the consequences of this type of disruption. Everyone has an internal clock regulating specific biological functions 24 hours a day. This is known as your circadian rhythm. These all can disrupt your internal clock. And, when your internal rhythm is out of alignment, it can impact both your sleep and wake time. Patterns of cell regeneration, hormone production and appetite all influence your circadian rhythm and a circadian rhythm disorder can disrupt your sleep-wake cycle significantly. Your circadian rhythm involves sleeping at night and being awake during the day. Certain factors, like melatonin production, affect your circadian rhythm. Your body produces the hormone melatonin and this hormone helps regulate sleep. Sunlight affects melatonin production. You have low levels of melatonin when you’re out in the sunlight. However, when the light decreases, like at night, your body begins producing more melatonin which makes you sleepy. Jet lag is one of the well-known circadian rhythm disorders. Changes in time zones causes jet lag and this can disrupt light cues and normal bedtimes. Often, jet lag doesn’t last very long and normal sleep patterns return. This involves troubles staying awake during socially and conventional acceptable times. For instance, individuals with advanced sleep phase syndrome might fall asleep at 7:00 pm in the early evening and wake up at 3:00 am or 4:00 am in the very early morning. There’s no clear cause of advanced sleep phase syndrome, but the elderly seem to struggle with it the most. Delayed sleep phase syndrome is the opposite of advanced sleep phase disorder. It involves not being able to fall asleep at what most consider a conventional bedtime. For instance, individuals with this syndrome might not fall asleep until two or three in the morning. Because bedtimes are a lot later than the normal bedtimes, individuals with this syndrome typically rise later in the morning. The issue for individuals with delayed sleep phase syndrome is they can’t match their sleep pattern with their work or school start time, leading to excessive daytime sleepiness. While common in teens, the cause of this syndrome is also not entirely clear. Shift work disorder causes troubles sleeping because of your work schedule. Usually, it occurs when you work rotating or overnight shifts. When working overnight, your body has to stay awake — and this works against your natural circadian rhythm. This disagreement between what you’re forcing yourself to do and what your internal clock wants to do disrupts normal sleep. Individuals with this disorder have a longer than 24 hours sleep-wake cycle. Their rise and sleep times become a little later every night. They’re continually changing their sleep times and eventually might stay awake around the clock. Those who are blind tend to struggle with this disorder. Dark patterns and lack of light make it difficult to regulate sleep in blind people. Individuals with irregular sleep-wake rhythm disorder have sleep times that tend to be out of alignment. They have sleep patterns that don’t follow regular sleep times at night. Irregular sleep-wake rhythm patients’ sleep is so disorganized there isn’t a clear wake or sleep pattern. Those with irregular sleep-wake rhythm might sleep off and on over a 24-hour period in a series of naps. They break their sleep pattern up into pieces, much like newborns that might sleep for several hours and then wake up for several hours. Some individuals only struggle with issues like jet lag when they travel. For others, the disorder is chronic, affecting their everyday living. These disorders often lead to sleep deprivation due to a reduced quality of sleep. It hasn’t been proven genetic factors increase a person’s risk of developing this disorder, but some circadian rhythm disorder symptoms might be more severe and have an earlier onset in some individuals with a family history of these disorders. Another big contributor to circadian rhythm disorders is light exposure. For instance, hypersensitivity to the evening light puts some people at a higher risk of developing the delayed sleep phase type. Circadian rhythm sleep-wake disorder treatment options depend on which type of disorder you have and how it’s affecting your quality of life. Maintain normal sleep-wake times (including vacations and weekends). Avoid nicotine, caffeine or other stimulants a few hours before bedtime. If you’re struggling with delayed sleep phase disorder and you’re becoming sleepy just in the early hours of the morning and sleeping until the afternoon, you should avoid the evening’s bright light. You should also dim your home’s light and avoid computer and TV screens. If you’re struggling with advanced sleep phase disorder and you’re sleepy in the early evenings and wake up completely rested in the wee hours, you should increase your exposure to light in the evenings. Spend time outside if it’s light out when sleepiness sets in or keep your lights on. Bright light therapy is also referred to as phototherapy and helps to delay or advance the time you should go to sleep. A sleep specialist will use a high-intensity light and provide treatment. They’ll expose you to around 30 to 45 minutes of bright light in the morning for delayed sleep phase disorder. It takes a couple weeks for treatment to really work. You might also have to undergo light therapy regularly to maintain your new schedule. The sleep specialists exposes you to bright light in the early evening if you have advanced sleep phase disorder to tell your body to stay awake for a couple more hours. Repeating treatment, in both of these cases, might be required occasionally to maintain your new sleep schedule. Chronotherapy is time therapy. You’ll advance or delay your bedtime by one or two hours each day, depending on which disorder you have. It could take weeks for you to shift over to your new sleep and wake schedule. Once you achieve your new schedule, you’ll need to commit to the therapy to achieve a successful treatment. If other types of therapy aren’t working, your doctor might prescribe you medicine to assist you in adjusting and maintaining the desired wake/sleep cycle. Medications can promote wakefulness while short-term sleep medicines can help with getting you to sleep. Melatonin can help with jet lag and is available over the counter. 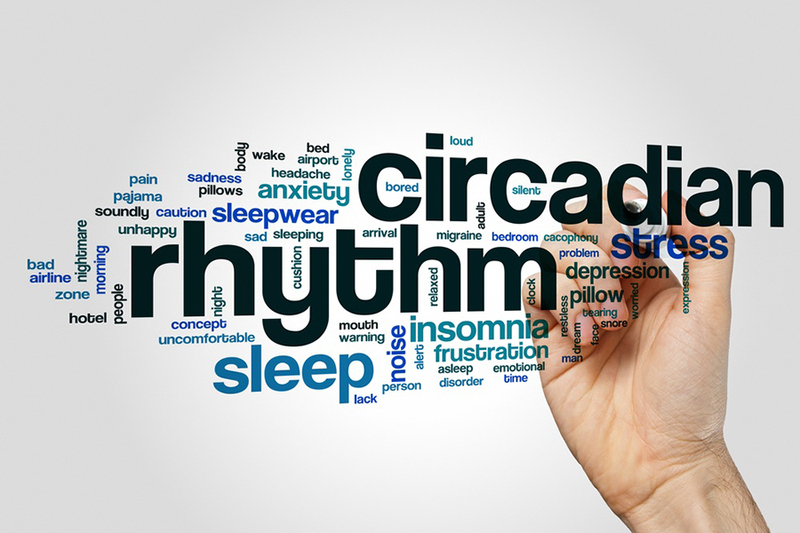 If you suspect you have a circadian rhythm sleep disorder severe enough that it’s disrupting your regular daytime activities, speak with a sleep specialist, like Dr. Abid Bhat, MD MBA, and discuss getting an evaluation and learning about your treatment options. Delayed sleep phase disorder, advanced sleep phase disorder and shift work sleep disorder all tend to place stress on relationships at home, school or work. By not receiving treatment to help with this sleep-wake cycle disturbances, they’ll keep on creating unnecessary strain in your life. Treatment is effective and can really make a huge difference — sometimes in just a few days. During your consultation with the sleep specialist, you can go over the symptoms you’re experiencing and decide on which treatment option is right for your individual needs. Don’t let poor quality sleep disrupt your life and wreak havoc on your relationships and commitments. Contact Dr. Bhat at Sweet Sleep Studio, LLC at (913) 221-6059. We have two locations (Leawood, KS and Shawnee KS) for your convenience.